Upper Bound for 21st Century Warming: The Right Climate Stuff Team (TRCS) is a group of retired and highly experienced engineers and scientists from the Apollo, Skylab, Space Shuttle and International Space Station eras. They have volunteered their time and effort to conduct an objective, independent assessment of the carbon dioxide (CO2)-caused global warming to assess the reality of the actual threat, and separate that from unnecessary alarm. They have applied the techniques they learned for space missions to this task. A rough engineering analogy is how can they be confident that an astronaut will not cook or freeze in a space station or a space suit. The TRCS model even includes the heat flow from the molten core of the earth. It shows that global temperature is not significantly affected by increases in atmospheric CO2. An increase of CO2 to 570 parts per million (ppm) will result in a maximum increase in global temperatures of about 1.8K – far less than the general estimates by the UN Intergovernmental Panel on Climate Change (IPCC) and its followers in the US Global Change Research Program (USGCRP), NOAA, EPA, etc. From ice cores, the estimated concentration of CO2 in 1850 was 285 ppm. So, the upper bound estimate in the TRCS model is at the low end of the 1979 estimate in the Charney Report of 1.5C with a doubling of CO2. The TRCS estimate is a maximum, and the actual result may be far less. In a video, Harold Doiron, a principle modeler of the lunar lander, presents the TRCS team’s simple, rigorous earth surface model using principles established in Conservation of Energy. He shows how the model is validated using 165 years of atmospheric greenhouse gas data and HadCRUT surface temperature data. Another problem with the IPCC approach is that it uses basically untestable concepts, such as equilibrium climate sensitivity (ECS), which may take hundreds of years to be tested, and demonstrated to be false. Another problem with the IPCC approach is the free use of aerosols, previously discussed in TWTW, where the values (usually a cooling effect) may be adjusted to produce an acceptable result in the climate models, tuning them to past observations. To avoid these issues, Doiron introduces the concept of Transient Climate Sensitivity (TCS) which is an empirically verifiable measurement for all greenhouse gases, as well as CO2 alone. TCS can be defined as the sum of CO2 and other greenhouse gases, feedbacks (water vapor and other positive and negative feedbacks) and aerosols. Doiron recognizes that his TCS may be too high, but it sets an upper bound. This upper bound is not scary. The Right Climate Stuff Team has written to President Trump, the EPA, and others stating that models need to be validated by data, and the entire issue of the influence of CO2 on temperatures needs independent, objective review. In the past, such as after the Challenger disaster, NASA conducted such reviews, called non-advocacy reviews. No doubt, many entrenched alarmist government entities will bitterly oppose such a review. See links under Challenging the Orthodoxy. Fat Tails Lead to Tall Tales: In his presentation, Doiron shows a graph of an EPA presentation with the possible distribution of increase in temperatures from use of fossil fuels of up to 10 degrees C.
· James Hansen’s skyrocketing sea level rise at the end of the century (NASA-GISS), etc. A proper upper bound analysis will do away with these fat tails. Perhaps that is why no US government entity has done one, even though the US government has spent over $40 billion on what government reports classify as Climate Science since 1993. We will await to see what the new administration will do. See links under Defending the Orthodoxy. Late 20th Century Warming An Artifact? In his presentation at Heartland’s Twelfth International Congress on Climate Change (ICCC-12), Fred Singer presented data supporting his assertion that late 20th Century surface warming is largely a result of poor placement of instruments, and improper analysis – not an actual warming of the globe. The poor placement of instruments is largely from a shift to airports, which have undergone growth in air traffic; and in urbanization of surrounding areas. Singer reports that the surface warming between 1910 and 1940 was genuine, and natural in origin. However, the reported warming between 1975 and 2000 as caused by CO emissions is not supported by 8 other datasets. These datasets include one from of the record high temperatures in the US from 1895 for 229 USHCN stations. The hottest years were clearly in the 1930s. The US had the most comprehensive coverage of surface temperatures of any country. Another dataset is sea surface temperatures by Gouretski et al., which shows warming of the 30s, 40s, and 1950s was comparable to that of the late 20th century. A tree ring dataset by Jacoby, et al. (AAAS, 1996) shows a sharp increase in temperatures from about 1880 to 1940 but little or no increase since then. Further, data from Avam-Taimr, the Southern Colorado Plateau, and Mongolia show little or no unusual warming in the late 20th century. Most compelling are the datasets from satellites and weather balloons which show that climate models, based on surface data, greatly overestimate the warming of the atmosphere. The satellite and balloon datasets are the only comprehensive temperature data existing. From these Singer concludes there is no evidence for significant human-caused global warming, climate models and observations disagree, and that the human contribution to greenhouse warming is not significant. Thus, CO2 is not a pollutant. See link under Challenging the Orthodoxy – ICCC-12. Hearing of House Committee on Science, Space and Technology: In his written testimony at the Committee hearing, Roger Pielke Jr. reported on the professional abuse he has suffered from members of Congress and from President Obama’s Science Advisor, John Holdren, who have chosen to politicize science and attack those who disagree. For Pielke, this attack included Rep. Grijalva (D-AZ) writing his university’s president demanding an investigation of possible funding of his work by Exxon-Mobil and the Koch Foundation, that Pielke may have failed to disclose. Pielke stated that he has called for a carbon tax. Also, he has stated that CO2 influences the climate system, the climate system is subject to multiple human influence, our ability to see the future is limited, certainty is not forthcoming, and stabilizing atmospheric concentrations of CO2 does not stop climate change. For these practical views, Pielke was branded as a “Climate Heretic.” Such is the sense of climate science in Washington. Pielke is no longer involved in climate research. · ”Scientific progress is driven by the creative tension spurred by disagreement, uncertainty and ignorance. · Progress in understanding the climate system is being hampered by an institutionalized effort to stifle this creative tension, in the name of a ‘consensus’ that humans have caused recent climate change. · Motivated by the mandate from the UN Framework Convention on Climate Change (UNFCCC), the climate community has prematurely elevated a scientific hypothesis on human-caused climate change to a ruling theory through claims of a consensus. · Premature theories enforced by an explicit consensus building process harm scientific progress because of the questions that don’t get asked and the investigations that aren’t undertaken. As a result, we lack the kinds of information to more broadly understand climate variability and societal vulnerabilities. · Policymakers bear the responsibility of the mandate that they give to panels of scientific experts. The UNFCCC framed the climate change problem too narrowly and demanded of the IPCC too much precision – where complexity, chaos, disagreement and the level of current understanding resists such precision. · A more disciplined logic is needed in the climate change assessment process that identifies the most important uncertainties and introduces a more objective assessment of confidence levels. See links under Seeking a Common Ground. After the Science Hearing: In remarks following the hearing, Judith Curry expressed disappointment and how Mr. Mann appeared to dominate the hearing. To Tim Ball this was not surprising. Tim Ball was sued in Canada by Mr. Mann, and forced Mann to withdraw the suit. He understands that showmanship and bluster frequently dominate in such venues, as do many members of Congress. For these reasons, when reporting on such hearings, TWTW emphasizes the written testimony, not the oral part too often dominated by showmanship and bluster. See links under Seeking a Common Ground, and Oh Mann. Number of the Week: The year 1942: Retired EPA scientist Alan Carlin listed seven examples of how environmentalists are making humans and the environment worse off under the guise of protecting the environment. One example was the EPA banning the use of DDT, which resulted in the efforts to ban it world-wide and the preventable deaths of millions of humans from malaria, particularly in less prosperous countries. In 1972, under Republican President Richard Nixon, the EPA banned DDT as a possible human carcinogen, without substantial physical evidence. In 2009, under Democratic President Obama, the EPA declared greenhouse gases, mainly carbon dioxide, endanger human health and welfare, without substantial physical evidence. The endangerment finding is used to justify efforts to curtail CO2 emissions, regardless of hardships it may place on humans, particularly in less prosperous countries. Any government entity that proclaims a chemical or a process that is beneficial to humanity as a threat to human health, without substantial physical evidence, is not to be trusted, regardless of political affiliation of the administration. See links under Environmental Industry. “The oddest criticism of Donald Trump’s climate action this week was the claim, mentioned almost triumphantly by every news source, that it would save few coal jobs. The economic and technological forces, especially the flood of low-carbon natural gas from fracking, are just too powerful. “Even so, many climate activists felt the need to walk back Ms. McCarthy’s concession by insisting Obama policies would have a measurable effect—on the amount of CO 2 released. Yes, the relative decrease would be tiny but measurable, though the climate effect would be zip. This is akin to medical researchers claiming a drug a success because it’s detectable in the bloodstream, not because it improves health. “And don’t get us started on the ‘social cost of carbon,’ a mechanism of policy justification created by the Obama EPA to assign a dollar-value benefit to carbon abatement rules that, in total, will produce zero impact on climate. “Pile up all the government policies enacted or seriously on the table, and their net effect is zilch. A new McKinsey study, that would be hilarious if it weren’t so sad, points out that Germany’s switch to renewables has been a success by almost every metric except CO 2 output—which is up instead of down. “No rational consideration, however, will abate the torrent of priestly imprecations hurled by green activists this week at Mr. Trump. The New York Times insists that Trumpian action “risks the planet”—plainly false since nothing either Mr. Trump or Mr. Obama did will make a difference to the planet. Did the Obama White House Collude with a Politically Motivated Scientist? We Won Climate Battles, but Are Not Winning the Climate War: Here’s Why. State-of-the-art (“CMIP5”) historical climate model simulations subject to anthropogenic forcing display an increase in the projection of this fingerprint that is mirrored in multiple observational surface temperature datasets. Both the models and observations suggest this signal has only recently emerged from the background noise of natural variability. In other words, in 2007 the UK government estimated that the UK alone would bear between 25% and 40% of the total EU-wide cost of the Renewables Directive targets, a share disproportionate to its population and the size of its economy. April 9, 2017 in Climate News Roundup. 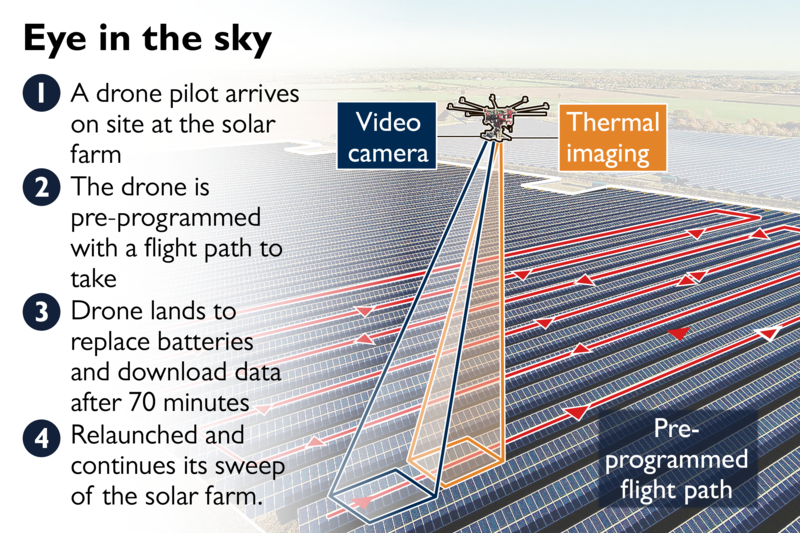 “A British drone company has pioneered the use of drones and thermal imaging cameras to make it possible for the first time to examine 100,000-panel solar farms. I thought the panels were the virus. Panels are plague on the countryside. DDT has never been banned for use in fighting malaria… it is still in use for that in some places. DDT was banned in general agricultural use due to environmental effects, not least those on birds of prey. linked to countries non-use of DDT. The near-complete worldwide ban on DDT is estimated to have directly caused some 40 million deaths, many of them children. That makes the proponents of the DDT ban some of the worst mass murderers in history. It was long predicted that when the body count was added up, the DDT banners would claim a ban never happened. We have heard it all here. You are making excuses for, and providing cover, for some of history’s worst mass murderers. Stop. Think about this one. Do you really want to be on that side of the issue? You assume perhaps that no other means of combating Malaria was used or available? And are you denying that in general agriculturla use it caused great damage to wildlife? In short, no, there was not mass murder from restricting DDT. This myth persists, but it is untrue. I’m betting he does “want to be on that side of the issue”. He does not seem to be interested in the truth or reality. So in his mind, he’s not on the wrong side. The dead are never his fault, even if there’e a straight line to that conclusion. Straight lines only count if they are trend lines on a temperature graph.